Truck and Trailers Manufacturers Association (TTMA) Breakaway Coupling for truck loading at terminals using bottom Loading Arms. This vital piece of equipment significantly reduces the consequences of a truck or railcar drive-off. Instantaneous closure of upstream and downstream flow reduces the risk of asset damage and injury potentially caused by spillage. Separation of the Breakaway Coupling protects the Loading Arm and loading vehicle (truck or railcar) from damage. Downtime and clean-up costs are also greatly reduced. This TTMA flange Breakaway Coupling by KLAW is lightweight, short and compact and is designed for the specific balancing requirements of Loading Arms. The KLAW TTMA Coupling is the shortest and lightest TTMA emergency breakaway coupling on the market. The coupling also replaces the spool piece. These two advantages are crucial where available space is often limited. Easy lightweight handling also improves operational efficiency. The KLAW TTMA coupling is available either as an automatic Breakaway Coupling or cable controlled Emergency Release Coupling. ATEX compliant strap is anti-static and fitted as standard. The KLAW TTMA Breakaway Coupling is therefore suitable for loading environments where there is risk of explosive atmospheres due to flammable gases, mists, vapours or combustible dusts. Typical flow rate: 4” DN100 – 2250 LPM. 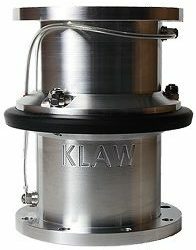 KLAW Flip-Flap Valve technology offers minimum pressure drop and significant flow advantages over alternative competitor valve designs. The KLAW TTMA Breakaway Coupling is approved and used by major operators throughout the world. The TTMA Breakaway Coupling from KLAW is Industry Standard. 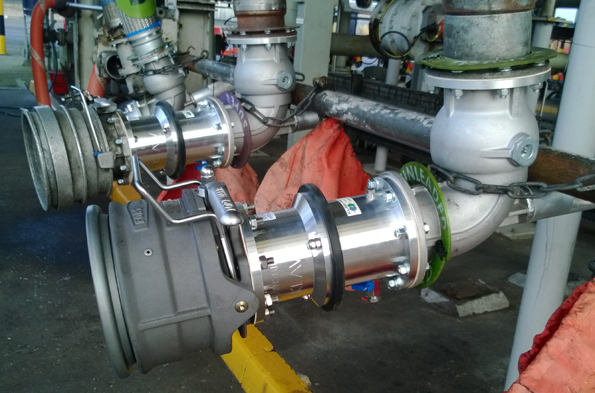 Shown below is a typical application of TTMA Loading Arm Breakaway Couplings from KLAW.